Monks, deadly attired, in the shadow of the Cathedral . . .
We have just returned from three days (extremely cleverly chosen!) in the Pembrokeshire sun. This was remarkably restorative . . . but not what I am talking about today. A few days before we left, we had reason to drive over to Hereford which is a city we are finding we like more and more as we discover more of the bits which do not give the feel of a ten-lane motorway! Our business concluded, we paid a visit to a fantastic little chinese restaurant for a delicious lunch that my taste buds have been yearning for since our last visit . . . and then had a bit of a wander round. A street market housed many stalls selling plants but our attention was captivated by one selling entirely wild flowers. Apparently the people concerned have obtained permission from all the correct conservation agencies to visit beautiful places around for the purpose of harvesting seed. The results were extremely beautiful and we could have bought the whole place! We did come away with a number of beautiful plants which we hope will join the rest of the wild flowers that come up undemanded and without any help from us in our uncontrolled domain. 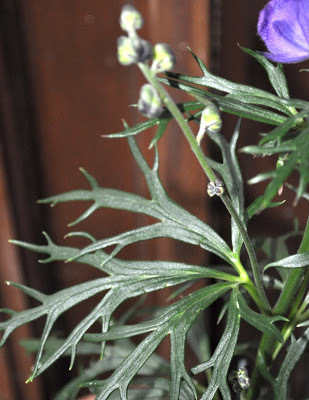 I became fascinated by one plant and took it home – despite protestations from Frances about the wisdom of importing a plant well-known for being deadly poisonous! 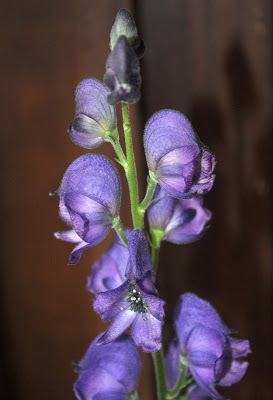 Here, therefore, are a couple of photos of my lovely Monkshood or Wolfsbane. What deliciously gothic names those are . . . only improved upon by the sight of the plant itself. The hoods on the plants look like a group of wickedly conspiring clerics on an operatic stage while the leaves are clearly demanding of mediaeval masons to be immortalized on decorated capitals throughout the Cathedral. Oh, I know, its just a weed . . . Thank you for posting pictures of that beautiful flower. causing damage if used unwisely. Who would want to eliminate foxgloves, lily-of-the-valley or hellebores from the herbaceous border, all of which can, in the right circumstances, cause considerable harm? I hope that you purchased more than one monkshood. The flowering spires look their best in groups. Of course you are correct. I expressed myself badly. I simply meant that 'some people would think it just a weed' . . . like the teazle which is round about my favourite plant of all! Stunning – I've never seen this wonderfully named flower before. What sort of damge does its poison inflict? Not that I'm going to find out by experiment! Glad to see you back, Nicolas, but I wholly understand about the gaps and breaks in blogging-energy. Apparently you have to ingest (any part of) it before you get the full death throes or whatever. We read that an elderly couple discovered the hard way that it was not the best plant to include in a 'cut-and-come-again' salad garden! It does apparently have medicinal uses (well, don't all those poisonous plants!) but I don't know what they are. It may be fabulous for sinusitus for all I know, to say nothing of blog-fatigue but I have to agree with you that it is probably clever not to try to find out! Better would be a well-earned rest for you and perhaps a gentle trip to Olympia to see Frances! Hi Nicolas, sorry I didn't get to Olympia to see Frances and your stand. I haven't felt up to making that journey – perfectly feasible in normal times – but in my current foggy state, about as feasible as climbing Everest. I'll be okay when I finish the rest of those large hard-to-swallow antibiotics. 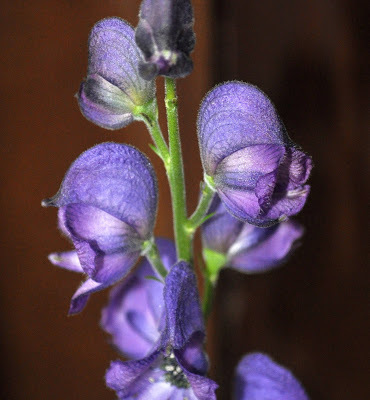 Maybe a touch of Monkshood as well?